The plight of the paltry audio emanating from those shining new HDTVs is well documented. My oft-repeated suggestion is to purchase a sound bar or even better a dedicated multi-channel sound system as a replacement to those tiny speakers integrated in those great looking TVs. If you wince at the thought of the expense of building such a kit, you will be pleasantly surprised at the price tag of this Sony STR-DH750 AV Receiver, which can serve as an extremely capable foundation for a medium-sized room's multi-speaker audio setup. Rated at 145W x 7, the able-bodied STR-DH750 supplies enough power to rock and rumble. It will also pass through 4K content from sources like Netflix or Amazon Prime. The STR-DH750 does not upscale HD material to 4K. 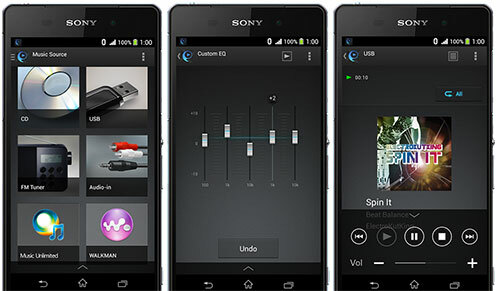 This Bluetooth receiver can stream audio from like-minded sources such as iPhones and Android tablets. Of note, this AV unit does not have wired nor wireless features, which means you cannot connect it directly to your home network. Therefore, internally, it does not offer streaming apps like Netflix or Pandora. To access those apps, you could attach an accessory like a Roku box, Chromecast, Fire TV stick or if you want to go old school, a Smart Blu-ray player. As you can see, this is not a do-it-all type of AV receiver, but that makes the STR-DH750 less imposingly complex and simpler to setup and enjoy. (Editor's note: In their consumer line, Sony currently offers four AV receivers with stair-stepping features and prices. For example, if you don't need a 7.2 channel capability, Sony offers the slightly less robust 5.2 STR-DH550 for about $70 less than the DH750. The Sony STR-DH750 appearance can be described as black box non-descript, in other words, typical AV receiver non-chic. Seriously, it's your TV that's the visual centerpiece of your system. AV receivers should be heard and not seen. On the brushed black front, below the white letters on black display are buttons for functions like Tuning, (you can preset 30 FM and 30 AM Channels), Bluetooth Pairing and selecting Music and Movie modes, all of which you can also perform from the comfort of your couch with the supplied remote control. Next to the conveniently located USB port is a mini-jack input for the Auto Calibration mic, which will be discussed later. And farther to the left is a headphones jack. If you look closely, above the Tuning tabs is a little "N" which is the spot where you can tap your NFC (Near Field Communication) device to connect it to this receiver. On the back of the STR-DH750 is the usual assortment of speaker and HDMI inputs. As you can see from the enlarged image, Sony supplies four HDMI 2.0 inputs (one is MHL compatible), and one HDMI 2.0 out (which is ARC [Auto Return Channel] compatible). In addition, it provides RCA type AV connections for more legacy equipment, along with digital audio inputs, two optical (both are assignable) and one coaxial. As mentioned previously, there is no LAN port to connect to your network. The seven speakers connections (Front, Center, Surround and Surround Back) are compatible with banana plugs. The STR-DH750 also supplies two outputs to powered subwoofers. In other words, plenty of muscle to drive equally matched speakers. In addition, the AV receiver supports High-Resolution file playback (up to 48k/16-bit PCM) when the source is input through the front USB connector. If your smartphone has become a digital appendage, then you can download the free SongPal app (Google Play or iTunes store), Bluetooth pair the DH750 to your device and use it as a remote control for the AV receiver and other accessories. Or you could grab the DH750's black, non-backlit remote and go tactile by pushing real buttons. The remote is quite spacious (1 7/8" x 7 13/16") allowing room for big buttons with easy to read labels. Sony designers have provided dedicated buttons for selecting input sources. By tapping on the Music or Movie button, you can cycle through different audio mode choices, such as for Movie, HD Digital, PL II, and Neo 6. If you do have a phone or tablet with SongPal, you will find its lit display easier to navigate than using the non-backlit remote, especially in a darkened home theater. Because of the STR-DH750 lack of complicated features, it is one of the simplest AV receiver that I have set up in a long time. That is not to say that it will only take you a few minutes from unboxing to room filling audio, but the process is fairly straightforward. It's a matter of hooking up your speakers, which the Setup Guide sheet will step you through. You should also connect to your TV so you can go through the on-screen instructions of initial Easy Setup. 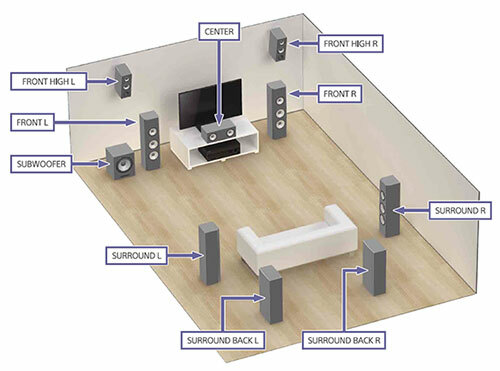 Once you have your speakers connected and placed in your room, you definitely should run the routine to calibrate your speakers to your room. It's an automated process in which you plug in the supplied optimization microphone and place it where your ears would normally be in your viewing room. The system sends out tones from your speakers and then calibrates the STR-DH750 for optimum sound output. The procedure is quick, easy and effective, definitely worth doing. Watch: Select to display video from the connected device. Listen: Select to listen to sound from the connected device. Sound Effects: Select to enjoy sound effects. Settings: Select to adjust the various settings for the receiver. Let me be clear, though this receiver is easy to setup, it still is worth reading through the manual to see a fuller view of the STR-DH750's capabilities. If you have been listening to your favorite action movies through the teensy speakers integrated into most modern TVs, when you hear the audio quality surrounding you from a multi-speaker system, your reaction will be somewhere between pleasantly surprised and freaking out. Where you land in that spectrum will have a lot to do with the speakers. A sound system is only as good as its weakest link and if you have under-performing speakers don't expect to be elated by the audio quality. With that said, the STR-DH750 does a solid job of delivering a clean, powerful signal that will nicely drive a matched speaker system. The unit handles a wide range of audio formats. I don't miss a 4K upscaling feature, but I do appreciate that it supports High-Resolution file playback. And it's worth experimenting with the different audio modes, especially the Music ones like Hall, Jazz Club, Live Concert, PL II Music and Portable Audio. To tweak even further, you can make adjustments on the supplied Equalizer. The AV receiver market is crowded with highly respectable models, but many are so feature-laden that you need to be an audio engineer to operate them. The Sony STR-DH750 thankfully sheds many of the more complex features while still outputting brawny, clean audio at a competitive price. At $350, I consider this receiver a good value. If you find it on sale for less, that's a bargain. Of course if you want a network connected receiver, than look elsewhere like the Wi-Fi enabled Sony STR-DN850. The Sony STR-DH750 7.2 channel AV receiver is not the most feature-filled unit in the marketplace. For example, it doesn't furnish wired or Wi-Fi connectivity and any streaming apps. Then again, it's priced accordingly. It does provide Bluetooth and NFC capabilities and video features like Ultra HD (4K) pass-through (but not 4K upscaling). Most importantly, the non-complicated, easy to use STR-DH750 produces clean, powerful audio, which makes it a great candidate as the driving force behind a straightforward, surround sound system. As moulto6 and R Chill have pointed out, this model does not support "true" 4K passthrough, as one might expect. I finally got Sony to admit that. The reason is that it does not have HDCP2.2, which is required for 4K. After a long conversation with them, they pointed me to this article: https://us.en.kb.sony.com/app/answers/detail/a_id/75522 This, to me, is a workaround, and relies on your TV having ARC (See the article). The passthrough is that it really bypasses the Sony receiver all together, and uses it as a slave. Nothing wrong with that, as long as your TV itself has true passthrough for the audio. The newer model STR DH&&) apparently does have HDCP2.2. One is supposed to see its label on the HDMI ports on the back of the receiver. I'm having the same issue as R Chil. I bought the new Xbox One S with 4K output. Seems the receiver pass through will do 4K if there isn't much information passing through (meaning that it passes a 4K signal if I am just browsing through the Xbox interface, but as soon as I try to push 4K content such as an UHD Blu-ray, the signal automatically kicks down to 1080). All my cables are 4K compliant, and if I bypass the receiver and go straight to my TV, 4K works great. Not sure if the 4K pass through handles certain frame rates or data rates, which cause it to choke. This receiver won't allow me to do 4K via my DirecTv receiver. My XBR 75 850C will play when plugged directly into the Sat box. With th reciever plugged in using 4K cables I am able to view up to 1080, but not 4K. I've changed inputs and upgraded cords, the unit states 4K on all imports. thx for the reply! Im finding now that my biggest issue is hearing the dialogue or having to turn down the volume when an action scene takes place becuse its too loud and full of bass. Im pairing the receiver with the Pioneer andrew jones 5.1 speakers which sound great during the day. But when night comes id like to have the volume low but still be able to hear the dialogue. Ive turned up my center channel to the max it will let me. Ive enabled night mode. Ive turned the volume on the back of my sub down all the way and turned the bass down on the equaliser. I turned the sub channel to the lowest setting for volume. And still its just way too loud. I get by with putting it in mutl stereo mode for now. That or ill just turn it off and go back to the tv speakers. But that defeats the whole point of owning all of this! Any thoughts?? When listening to BT or AM/FM, it appears the on screen controls are being output 1080p... Is there a way to change the unit to output 1080i? To Dave: The HDMI inputs of this receiver are NOT HDCP2.2 compliant. So if the input signal has HDCP2.2 content it will not display on the TV when passing through this receiver. Will the STR-DH750 allow 4K pass through with the onset of HDCP2.2? I'm finding that HDCP2.2 connectivity is crucial for displaying 4k content. Hopefully this review is still active and can provide me some useful insight. I came across the STR-DH750 as a way to get my feet wet with a home theater receiver. At this time all I'd need is a 5.1 set up. Can the STR-DH750 be used for 5.1 surround now until I'm ready to bump up to 7.2? Yes, the 4K TV will do the upscaling. Therefore you don't need the receiver to also do it. I've found that if you employ both the TV and receiver to do 4K upscaling, you often see unwanted artifacts. Now, some 4K TVs do not have great upscalers. I would suggest that you try the scaler in the receiver and the TV separately to see if you prefer one over the other. Though typically, I would leave the 4K upscaling to the TV. im confused a bit, for 4k upscaling.. dosnnt the 4ktv do that itself? why would i need 4k upscaling built into the reciever if the tv does this already? am i missing something? Any chance that the HDMI pass through will not work with a 720P LCD Television? I'm not getting any audio or picture through the HDMI pass through. However, while connected, when I change the TV source from HDMI to any other source, the audio from the receiver works. Is this just the case of old technology (The TV is about 10 years old) or the HDMI out port being bad on the receiver? Any ideas or tips would be greatly appreciated. Thanks!